How to safely deal with ant pest control in Sydney Australia. 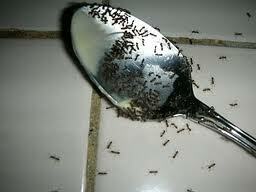 Those pesky ants are back in the kitchen! Add pool, driveway, barbecue or most other places in your home or office. They are one of the most complained about pests in Sydney, Australia. People often ask me on how to get rid of ants for a long period of time. The answer is NOT to use highly toxic borax or rush to find something in Bunnings. When is a bait not a bait? A lot of people tend to confuse the white plastic containers that we supply containing the gel as the “ant baits”, thinking that they only have to place a container in corners of rooms or near the ants to attract them into it. Liz Hurley regrets not having ants pest control done before Summer! Most ant species are highly developed social insects that live in permanent nests, which depending on the species, may be in the soil, in timber, under pavers, in wall cavities or roof voids. Ants may travel large distances in search of food. 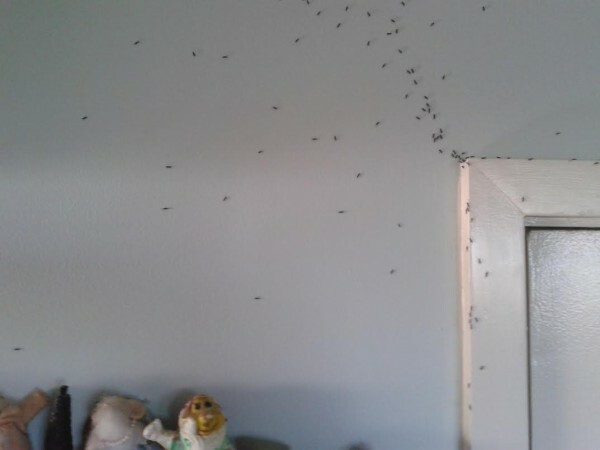 Even the cleanest of homes can provide a ready food source for ants which once found can invade in large numbers, such that professional help is required. Some inflict severe bites but most are a nuisance pest when they infest kitchens and BBQ areas in large numbers. Identification of the particular species of ant is vital to implementing a control program. Pest Management Professionals (PMP’s) have at their access a variety of baits, insect growth regulators, and non-repellent materials, which can be used together in an integrated approach to solving any ant infestation. Ants are now the number one pest problem for which homeowners rely on professional advice and remediation, Since an interior infestation is likely to have resulted from outdoor populations, you should expect your pest management professional to perform a thorough inspection of the surrounding environment and develop a strategy to prevent reinfestation of the building. The number of bait locations and amount of bait required will depend on the level of ant activity present. To achieve the best result, additional bait placements should be provided if initial bait placements are consumed within a day or two and if ant activity remains high at the bait after 2 days. Place bait along ant trails and other locations where ants are most active. Remove other sources of food. Place bait where it won’t be disturbed or contaminated by cleaning or work activities. For outside use, place spots in protected cracks and crevices or use refillable bait stations. Choose the number of placements (1 to 3) depending on the severity of the infestation. Monitor bait levels (preferably daily for first 2 days) and replenish bait as required until feeding ceases. We don’t recommend DIY treatments for ants like Borax or Ant Rid as they may be dangerous or ineffective. Call in the experts to get it done quickly, safely and the right way. Try not to leave washing up overnight as it attracts ants. Identification: the worker of the White-footed house ant is around 2.7mm in length, and black in colour with yellow feet. Biology: Colonies of white-footed house ants often contain many satellite nesting sites spread over a wide area. The entire brood may contain several million workers and numerous reproductive queens. White-footed house ants have a preference for sweet tasting food, such as sugar, soft drinks and the like. Identification: the Odorous house ant is about 2 to 3 mm in length; of uniform black to brown in colour and if crushed, has a distinct rotten odour, like rancid butter. Biology: Odorous house ant colonies can contain around 10,000 ants and contain numerous reproductive females, that can establish subsidiary colonies. Ants from different colonies are not aggressive toward each other. Nesting sites: their nests are commonly found include outdoors in the soil, under the base of trees, and indoors. Nests in the soil are usually shallow, situated under a stone, pavers or other flat object. They commonly nest under buildings and inside wall cavities, particularly if there is a regular moisture source available, say from leaking plumbing, shower recess, broken guttering and roof tiles. Identification: The workers are all the same size about 1/16 inch long. They are yellow or honey-coloured. They have 12-segmented antennae with 3-segmented club. Nesting sites: They build their nests in wall and cabinet voids, behind baseboards, inside hollow curtain rods and in folds of sheets, clothes or paper. It’s not common to find bulldog ant (or bull ant) inside buildings; they are located mostly in bushy areas where they can have their nest in soil near wood logs or under rocks with extensive tunnel system. When the nest gets disturbed the bull ants get very aggressive, they will all come out of the nest as a massive force to attack whatever is taking their peace. Identification: Carpenter ants vary in color from black to dark brown to an brownish orange. The workers are 6 to 12 mm in length. Biology: Carpenter ants often enter buildings to nest and forage. They excavate their nests in wood (hence the name “carpenter” ants), creating smooth tunnels and galleries. The colonies of some species of Carpenter ants, may exceed 100,000 workers, with multiple queens and satellite nesting sites. Most species are smaller and require many years to reach maturity. They can travel long distances in search of food. Identification: They are uniformly dull brown coloured. Workers are all the same size, about 1/8-inch long. Thorax uneven in shape when viewed from side. They emit musty odour when crushed. Nesting sites: Outdoors in soil, under wood, slabs, debris, mulch or in cavities of trees and shrubs. Shallow, 1-2 inch deep mounds in open, often distributed habitats, either moist or dry. Effective control of ants often relies on a knowledge of their foraging and nesting habits. At the broad level, a knowledge of the nesting habits and feeding habits of important pest species can be helpful. More specifically, where a given infestation is being treated, a thorough survey and inspection should be carried out. By following trails – particularly, where possible, those of workers loaded with food – the location of the nest, either approximately or precisely, may be determined. Direct treatment of the nest, where possible, can provide the most effective, longer-term control. Alternatively, the use of chemical barriers that interfere between the nest and possible food sources is often effective. 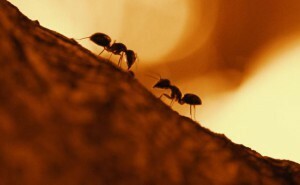 The state of hygiene and sanitation in and around buildings influences the likelihood of infestation by scavenging ants. Indoors, all areas should be kept free of food particles. Typically, surfaces that become contaminated with crumbs and other food particles include kitchen bench surfaces, shelves and drawers, floors, tables, chairs and so on. Food utensils should be washed up soon after use and not left unwashed for long periods. Outdoors, the area should be free of food sources (e.g. bones, unclean pet feeding bowls, unrinsed drink bottles and cans). Tolerating sap-sucking insect pests on plants around a dwelling may serve to support and encourage various ant species. 1. The direct treatment of the nesting site. This may be accomplished by the application of dusts, residual surface sprays or space-spray type system where nests are located within the confines of wall voids and the like. Such direct treatment may require drilling or other modifications for access. 2. The formation of residual barriers between nest and food sources. Often it is not possible to treat ant- nesting sites directly. Where this is the case, dusts or surface sprays may be applied to those surfaces, cracks and crevices over which the ants travel for food. As ants can be repelled by certain inssecticides, and as they can be most resourceful in finding new routes to a food source, it is important that the barrier treatment be a comprehensive one that, within the constrains of safe practice, attempts to isolatee the nesting site from food sources. Surface sprays – In ant control, surface sprays in the form of emulsifiable concentrates, wettable powders, suspension concentrates and foams are foams are widely used. Such treatments may involve treating outdoor nesting sites and/or spraying surfaces over which the ants travel. These may include cracks in paths, wall-path junctions, points of entry such as window stills and door jambs, and wall voids. Ants generally trail along defined architectural lines such as expansion joints, pipe, joints in masonry or edges of paths. Indoors, areas serving as travelling routes might be treated. These may include the bases of skirtings behind kitchen equipment, window and door frameworks, corners among cupboards and benches, and various cracks and crevices. When used effectively, these chemicals, backed up by sound sanitation and hygiene practice, should give suitably long-term protection. Space sprays – Insecticides applied as space sprays have limited application in ant control procedures. Where the method of application has facility for crack and crevice treatment, this may prove useful for the direct treatment of nesting sites that are reasonably confined (e.g. in brick cavity walls) – provided that safety implications are taken into account. Dusts – Insecticdal dust formulations can be useful in ant control. They may be applied directly into nesting sites (where known) or lightly on surfaces over which the ants travel. Dusts can be particularly appropriate in the treatment of sensitive areas such as switchboxes, equipment and wall and roof voids. Baits – Insecticidal baits are widely used in situations where nest location and treatment is difficult or impossible, or where insecticides in the form of sprays or dusts are not appropriate or allowed. The baiting approach usually relies on the transference of insecticidal baits back to the nest, where all the individuals, including the reproductive female(s), will eventually consume the poison in suffcient quantity yo cause death. Baits are very effective in the control of a variety of ant species. Competition from other food sources is a common hindrance to the effectiveness of baiting. In placing baits, the safety of children and pets should be considered. In general, ants may prefer either carbohydrates, fats or oils, but some may be attracted to two or even three of these food groups. 1. A thorough inspection and survey/analisis of activity patterns. 2. Direct treatment of nests where possible. 3. Formation of insecticidal barriers between nests and food sources and/or the placement of baits in appropriate loactions. 4. The adoption of high levels of sanitation and hygiene.